"I realize that as I paint with watercolors, I am constantly aware of how much more I have to learn. And as I get more familiar with a subject matter, I want to find different techniques to better paint it. Its that constant learning that makes me enjoy painting so much, and Jill’s workshops provide me a great place to find the answers and the tools I am looking for." "Artist Jill Rosoff is not only a wonderful painter, she's an exceptional teacher, and eager to share her enthusiasm for watercolors with each and every one of her students, regardless of their skill level. Anyone looking to explore the wonderful world of watercolors would be lucky to have Jill as their instructor. Jill makes learning fun!" "Jill has a commanding presence to bring out the art that's within you. If it's there, Jill will find it and you will be forever grateful for the experience." "Jill’s paintings are orchestras of flowers." For those who have some, or even no watercolor experience! Learn the ways to use your brushes effectively with watercolors in this one-day workshop. Through the course of the day we will go through different uses of your watercolor brushes for different results. Through demonstrations and then hands-on practice, you'll have the opportunity to use the techniques presented. At the end of the day, you’ll have a better idea of how your brushes can most effectively give your fresh, clean watercolors, and avoid overworking the paint. Cost: $150.00, includes lunch. Come and explore! Come find my scarves and pillowcases, including my new line of cotton scarves! The perfect for the California and tropical climates. Find my booth number shortly on my Facebook page! Please watch for my emails, or check my Facebook Page for updates! These ongoing workshops are open to painters at all levels of experience in watercolors; from novices to experienced watercolorists who want to refine their work. Just bring your passion and desire to learn. Come explore your creativity, expand your knowledge and become more in tune with your technique while we work on watercolor techniques, color, composition and drawing. Sessions can include demonstrations, technique exercises, individual mentoring and of course the energy of painting in a group environment. During each session we share everyone’s progress in informal critiques as a part of the learning experience. Cost: $35.00/session. 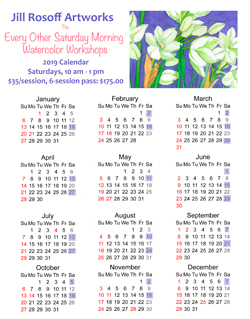 You can also purchase a 6-class pass for $175.00 at any workshop. Students provide their own supplies. Dates are subject to change. Please email me if you plan to sign and if you plan to attend. To Register: Contact Jill to sign up, or to ask any questions you may have about the workshops.